Road rage soccer mom mini van lunatics! What happened to women in mini vans? I have a simple three mile drive to work that I have done so often I expect to see grooves in the road. In the last three months, I have seen a rash of crazy mom drivers! You gals are completely off the freakin chain! Let me first say that I have to see at least one car seat in the van before I upgrade the person to mom status. Also, obviously, the driver has to be a woman. So far, when it comes to the crazy mini vans or similar SUVs it is always a mom. Around the corner from my house, for some idiot reason, San Jose extended a second lane about 100 yards before and after the intersection. So it goes from one lane, to two lanes then collapses back to one lane. This leads some drivers to jockey for a better position. So in the normal lane, we have a dual exhaust Mustang indicating the bigger motor and in front of him is a Porsche. Then in the open lane up comes… you guessed it… A MINI VAN. I can see her on the phone too. You know why? Because she isn’t wearing a bluetooth. She has her phone cranked up to the side of her head just like they did back in the 20th century! Also, there are two kid seats that I can see and one definitely has a kid in it. The light turns green and I swear this little Danica Patrick wanna be actually gets some scratch as she takes off! Now the Porsche isn’t stupid and doesn’t try anything for three guessable reasons. Doesn’t want to loose to a mini van. I kid you not, it had to be some kind of GT model. Doesn’t want to be hit by a mini van. She’s crazy an on the phone, it could happen. Of course once she gets her position in first place, she immediately drops to the speed limit which none of us were going to do. So now, we are all drafting behind a mini van doing 35. I swear the only drivers I have seen that are worse are either in Fed Ex trucks, notoriously more impolite than their UPS counterparts in my opinion, or Frito Lay trucks (I had one of these throw a side view mirror over my car once while he was trying to hit another truck). Now that I think back to the 70s and 80s, my own mom had a nickname given to her by the guys in cross country who got a ride from us to get to meets. They called her Lead Foot. I remember a time when I was around 8 that I was warning her she was speeding. She brushed me off. Then a cop pulls us over and comes up to her window and says “Did you know you were speeding ma’am?” and my mom said “No officer” and of course I chimed in “Sure you did, I just told you that you were speeding!” Needless to say, I am not my mothers favorite son regardless of how I purport myself. If you have your kids in the car, don’t drive like a lunatic! 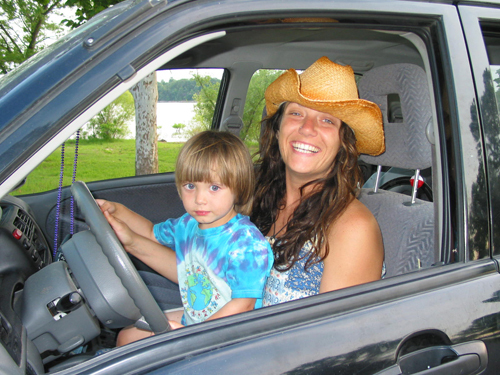 Fight in genetic disposition to join the ranks of crazy mom drivers! I’m just lightly dreaming about bad things happening to you, but I don’t really want any of them to come true. There are other nut jobs out there that will make sure the bad things come down on you like ugly on an ape. Be safe and be safe. Oh, and get a bluetooth or stop talking while you are, for lack of a better word, driving.